After gaining her first degree at the Mehran University of Engineering & Technology in her native Pakistan, Benazir spent four and a half years working in web application development, but still felt that she would benefit from postgraduate study. "I wanted to learn more about web development, as well as mobile computing which is the fastest growing area of this kind of technology," she explains. 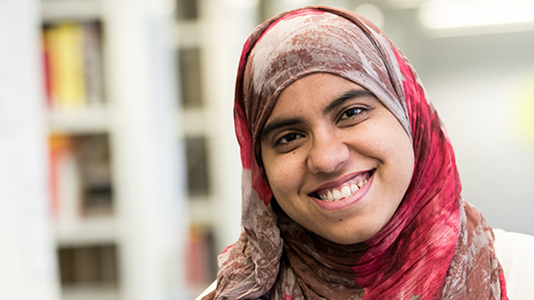 Benazir found our MSc Web & Mobile Computing through an internet search. The course is designed to develop the technical and business knowledge needed to operate at the strategic levels of an organisation, which made it ideal for Benazir. "The course content was exactly what I was looking for, because I would like to take a strategic role within a business or start my own company," she says. While investigating ways of funding her studies, Benazir heard about the Vice-Chancellor's Scholarship and submitted an application. To her delight, she was successful, and the money she has been awarded is likely to have a significant impact on her studies. "This scholarship will help me to fully concentrate on my studies because it reduces the burden of paying all the fees by myself. Now I don't need to work as much in order to pay for my studies. I am so thankful to almighty God, my university and the Vice-Chancellor for this scholarship because it will help me achieve my future goals," says Benazir. LSBU awards up to £48,000 in Vice-Chancellor's Scholarships and bursaries to postgraduate students each year. They are made possible by donations to our Annual Fund from alumni and other supporters. Visit postgraduate scholarships.